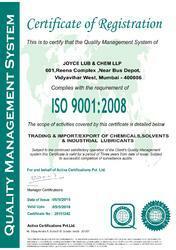 Established in the year 1982, we JOYCE LUB AND CHEM LLP (an entity of Bombay Lubricants Oil Company) an ISO 9001:2008 certified company are engaged in importing & supplying a wide range of industrial chemicals, industrial solvents, liquid industrial solvents, powdered industrial solvent and lubricants. Our entire range encompasses industrial lubricants, industrial chemicals and industrial solvents. These chemicals are widely demanded in industries and sectors like Pharmaceuticals, Chemical Intermediated, Paper, Dye, Food, Textiles, Ceramics, leather, Petroleum, Pharma, Urea Technical, Paint and Resin Polymer. We have grown leaps and bounds with the support of our rich vendor base, which is a source of quality chemicals. These vendors are carefully selected from masses only after they pass through stringent criteria. For these arduous tasks, we have employed qualified procurement agents along with other professionals, who are responsible for sourcing pure chemicals. In addition to this, our infrastructure also acts as a standing support for us. The capacious warehouse unit enables proper storage for our clients. We are prevailing under the mentorship of owner Mr. Jatin Shah, who has vast industry experience and sharp business acumen. His able guidance enable us to perform our trading activities with ease and diligently. This has enabled us to get a strong foothold in India as well as in gulf countries. Our warehouse is one of our prominent features that enable us in carrying forward our trading business with an ease. The capacious unit is segregated into various sections for storing our range of industrial chemicals as well as lubricants in an appropriate way. We have employed warehouse personnel, who are capable of handling the unit and the stored products properly. Our warehouse is kept neat and clean as well as protected from pests that assure apt storage of the products till their dispatch. Only those vendors are selected, who stand at a high position, while their evaluation is done on the above mentioned criteria. This assures effective link-ups and quality products for every customer. The procurement agents are responsible for conducting market surveys and selecting the best vendors. Chemical engineers and quality analysts are involved in sourcing and checking the products on various parameters to make sure that our clients receive only the best. Apart from these professionals, the sales and marketing personnel enable brand promotion and bring in more clients for us.